Zinc keeps your immune system healthy, regulates the synthesis of protein, ensures normal growth and supports the senses of smell and taste. If you don't get enough zinc through your diet, you can boost your intake with supplements such as zinc gluconate and chelated zinc. But be prepared to do some comparison shopping because they're a diverse group of supplements, with different ingredients and varying amounts of zinc. In supplements, zinc is combined with other ingredients known as chelating agents. One type of chelated zinc -- zinc gluconate -- consists of zinc attached to gluconic acid, which comes from fermented glucose. 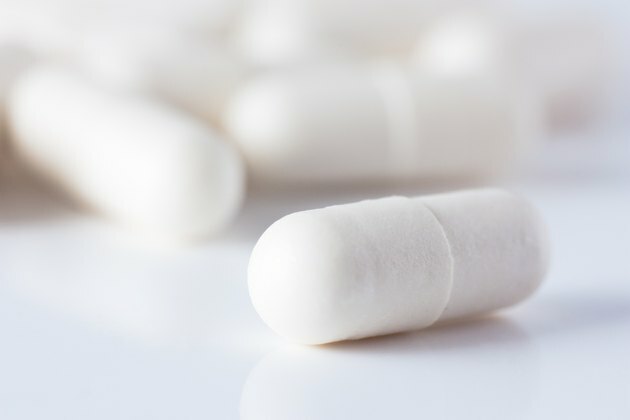 Other supplements combine zinc with a variety of compounds, including orotic acid, picolinic acid, or one of several different amino acids such as glycine and methionine. You can usually identify the chelating agent by the supplement's name; for example, you'll find zinc picolinate, zinc orotate and zinc methionate. No matter which type of chelating agent is used, they all serve one important purpose: They improve the ability of zinc to pass through the intestinal wall and be absorbed into your bloodstream. Even though all types of chelated zinc boost absorption, researchers still can't agree on which form is the most effective, according to Colorado State University Extension. Until future research provides a definitive answer, four different forms of chelated zinc are most often recommended. Thorne Research suggests that zinc picolinate is absorbed better than other chelates, while the Global Healing Center recommends zinc orotate for optimal absorption. A study published in "The FASEB Journal" in March 2008 concluded that zinc glycinate boosted blood levels of zinc better than zinc gluconate, and they were both better than zinc picolinate. The actual amount of zinc in a chelated supplement, called elemental zinc, differs according to the chelating agent. For example, about 14 percent of zinc gluconate consists of zinc, while zinc picolinate supplements contain nearly double that amount. Look for the amount of elemental zinc listed on the product label, then use the differences to target the product that best fits your needs. Track your diet for a few days to see how much zinc you normally consume, then use that as a guide for choosing the chelated form that provides just enough elemental zinc to meet your daily requirement. The Institute of Medicine recommends that women get 8 milligrams of zinc daily, while men need 11 milligrams. Your daily intake of zinc from all sources should not exceed 40 milligrams, according to guidelines from the Institute of Medicine. Getting too much zinc may weaken your immune system, deplete the amount of copper in your body and negatively affect iron and cholesterol metabolism. High doses of zinc may cause side effects such as nausea, vomiting, diarrhea, cramps, headaches or a loss of appetite. Zinc can interact with some medical conditions, so be sure to consult your physician before taking supplements if you have diabetes, human immunodeficiency virus/AIDS or take any prescription medications, including blood pressure medication, antibiotics or water pills.